Preschool | More Crunchy Beach Mama! This is a Sponsored post written by me on behalf of K12, the leader in online education for SocialSpark. All opinions are 100% mine. I announced on the blog the other day that we have decided to keep P’Diddy home next year for school too. We are just having so much fun with our preschool homeschool and have developed a great routine. What I am starting to think about now is the curriculum I’m going to use next year. Will I use the same or maybe try out something different? I have just learned about EmbarK¹² and now get to explain to you what it is all about. It sounds really neat! EmbarK12 Comprehensive- Online and hands-on preschool program for your early learner. Let me explain them a bit. 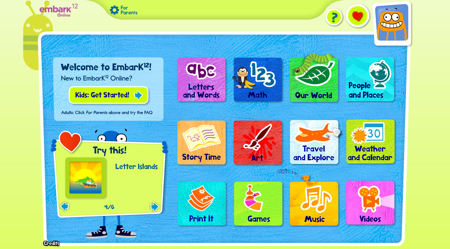 EmbarK12 Online – Over 830 interactive activities to engage your preschooler. They are designed to be self-guided and the child will play games while preparing for Kindergarten with basic skills such as mathematical reasoning, early literacy, scientific observation, investigative skills, and much more through stimulating engagement. Topic examples are ‘Travel and Explore’, ‘Our World, ‘Story Time’. Each is done through music, songs, video and other kid friendly ways. P’Diddy LOVES doing games on computer devices like his brothers and I can really see him digging this. He wouldn’t even realize he’s learning! The online is $59/yr but I have a DEAL for you at the bottom if you act quick! For $286/year you receive a HUGE kit of everything you would need for the year and easy instructions to guiding your child along. Storybooks, art supplies, learning toys, and more are included! Sounds awesome to me! 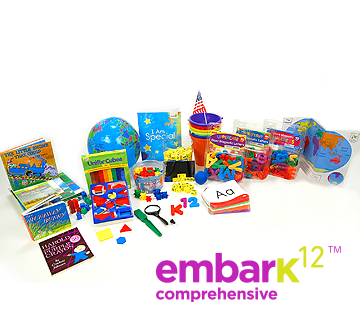 EmbarK¹² Comprehensive & Online are the preschool programs for the already well-known and award-winning K¹² who works with more than 5,000 teachers across the U.S. – the largest network of online school teachers in grades K through 12. Did you know that learning at home could be so readily available? They are partnered with over 2,000 school districts. One of them could be yours. Learning at home as always been at the back of my mind for my big boys and glad that I am starting P’Diddy this way with preschool. Who knows where it may lead! Kindergarten readiness programs by K12. Try a sample activity today. DEAL for you! For the next 7 days use code: EmbarkSpecial to try out the EmbarK¹² Online for $29.50/year, instead of the original price at $59. Sounds good to me! Have you considered online learning?